Southwest Quinoa Bean Salad is a healthy, vegetarian salad recipe that’s packed with flavour and nutrients! 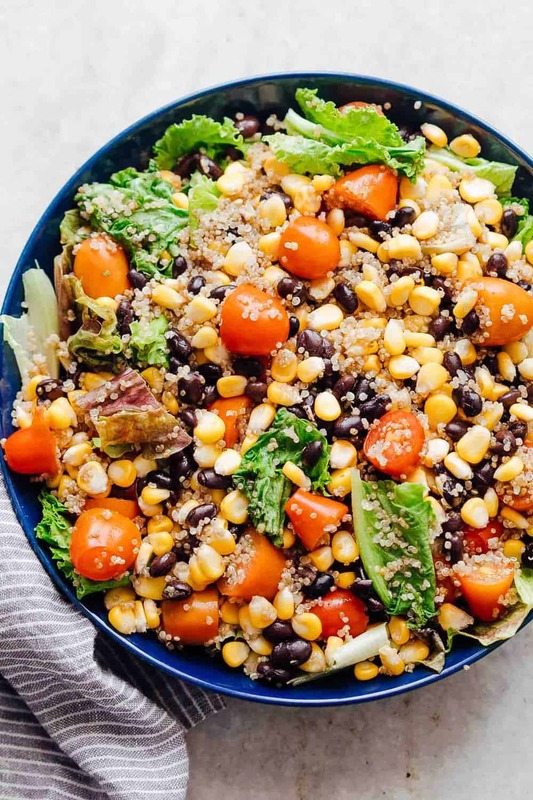 Its loaded with lettuce, quinoa, black beans, corn and tomatoes and drizzled with a delicious southwest dressing. Hey there! It’s Richa from My Food Story with an insanely delicious Southwest Quinoa Bean Salad that’s going to become your favourite lunch box recipe! The start of the year is always packed with resolutions in my family but I know them too well. They need healthy, but delicious healthy. And healthy that fills you up – not something that makes you wish you had another lunch sitting somewhere because you are still so hungry. This salad is perfect because it packs in more than just nutritious ingredients. It’s light but because of the quinoa, beans and corn, it gives you the feeling that you have eaten well. The southwest dressing is a light mix of olive oil, lime juice, cilantro, honey, oregano, garlic and chipotle powder. 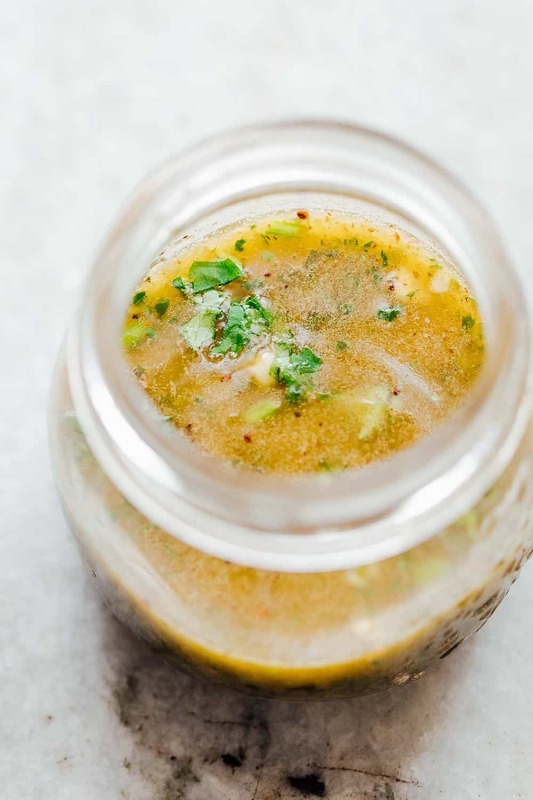 Its a dump and blend kind of dressing so you can either shake everything in a jar or like I do – blend it up in your food processor for a super creamy dressing. The salad soaks up all the dressing so that every bite is super YUM! Let’s just talk about that dressing for a bit. I know you can easily buy southwest seasoning, but since we are staying on this healthy track, we must try this out on our own. And this dressing makes it sooo easy! It’s creamy, light, tasty and I love pouring a little extra because I like to eat the dressing pooled at the bottom with a spoon. It stays in the fridge for a couple of days and you can even use it to marinate stuff. If you don’t have chipotle powder available, just use some smoked paprika or even regular paprika or cayenne for that extra flavour. This salad doesn’t get super soggy if it sits for an extra few minutes but if you are serving it later, just assemble the salad ingredients and pour the dressing right before serving. This is a quick and easy salad that I know you’d absolutely love and I can’t wait for you to try it! Southwest Quinoa Bean Salad is a healthy, vegetarian salad recipe that's packed with flavour and nutrients! 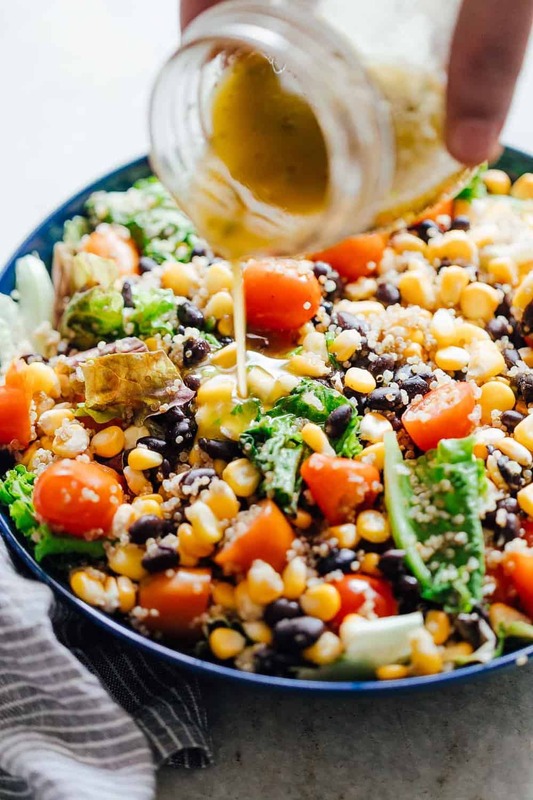 Its loaded with lettuce, quinoa, black beans, corn and tomatoes and drizzled with a delicious southwest dressing. Blend all the ingredients for the dressing in a blender for a minute till smooth. Transfer all the ingredients for the salad in a bowl and toss with the dressing. If serving later, pour the dressing just before serving to avoid the salad from getting soggy. I’m a meatetarian and I loved this! This looks very delicious. Are you able to provide the calorie count? I do weekly meal prep and log my food daily. I want to add this to my weekly salad options. Thanks! I made this recipe for part of a Cinco De Mayo celebration with friends. It was so good. Much more complex and interesting than I expected in a good way. I also had a yellow bell pepper that I needed to use and tossed it. Nice combination of flavors and textures but really pretty easy to make. I highly recommend.